Planning on servicing your truck? Although we are primarily one of the largest UD Trucks dealerships; situated in Heidelberg Road, Alrode, Alberton; we are also equipped, to service other makes of commercial vehicles. 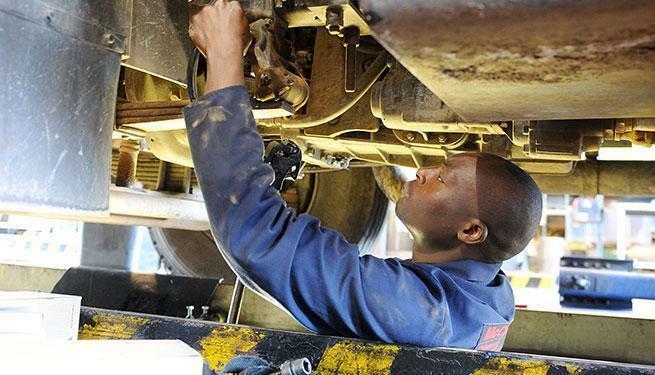 In addition we also have trained technicians who specialise in Mercedes Benz, Powerliner and Econoliner rang of vehicles and all makes of trailers. All our permanently employed Technicians have received the latest training offered by UD Trucks S.A.
We have the latest wireless testing facilities. This valuable equipment is able to test several safety critical aspects on trucks and trailers, including brake efficiency, air pressures, axle weights, play detection, combination brake harmonization etc. Technicians are also able to determine technical defects in a shorter period of time, saving on valuable downtime. All work done are “in house”—-NO SUBLETS! AUTO ELECTRICAL repairs are done “in house”—-NO SUBLETS! AIR CONDITIONERS in house re-gassing and repairs —-NO SUBLETS! WHEEL ALIGNMENT AND BALANCING to all makes of trucks and trailers is another service we offer “in house” and mobile. Speak to us about our mobile service offering & Offsite Turnkey Management solutions that can add value to your business. Is the distance to our Service Centre a problem? Does the downtime on your vehicles cause a dilemma? COF = Bring your vehicle with the registration papers and we will get you the certificate!!! NO FUSS!! Only GENUINE UD Trucks approved replacement parts which carry one year warranty are used, thus optimizing Life Cycle Costs on your vehicles. The use of non genuine parts used by non accredited workshops often nullify the warranty on the vehicle. It’s been proven to have a shorter life cycle and become less effective with time. These non approved parts are often subject to price “mark ups”. Planning On Purchasing A New Truck? We Will Endeavour To Better Any Legitimate And Valid Written Quote ! !